How to tell what weight of strings are on a guitar? We have 4 guitars in our house and I just broke a string on my daughter’s. The problem I’m having is that every replacement set of strings are different weights and my daughter can’t remember which set are hers. Is there any way of figuring out which weight of strings are on her guitar so I can match up a corresponding replacement string set? Well, it’s pretty hard just by looking. I recommend you just replace the whole set, especially if you have a guitar with steel strings. You can get a brand new box of strings for less than $10 and all of the strings will have the same amount of wear and age on them. Steel strings generally start sounding dead after a couple of months no matter how little use they get and need regular replacement anyway. While classical guitar nylon strings don’t need to be replaced as often, it is still nice for them all to match. You don’t necessarily have to replace them with the same weight that was on previously. However, if your neck was set up for ultra light strings with really low action and you move to extra heavy ones you might get some buzz on the frets. But for the most part this isn’t a problem. I’d err on the side of caution and get a lighter string. Or you can take it into the local guitar store and they should be able to give you a good idea of how heavy the original strings were. That’s what I thought. Well it looks as though she’s going to get a lot of practise changing strings lol. She’s left it up to me thus far. Thanks for your answer. I suspected there was no way to tell. What kind of guitar is it? It’s a small acoustic one. She has steel strings on it. I’m pretty sure they are light strings. I stupidly handed the replacement string package to her when I replaced a string for her and asked her to store it. If you don’t already have one, invest a couple of extra bucks in a string winder. It will make the string replacement job much easier. Are the strings silver (in color) or goldish bronze? Silver are steel the latter is bronze. Regardless though, a small acoustic with what you would say are light strings could probably be a .046 – .010 scale. Usually on many bigger acoustics (normal ones like Gibson, Ovation, ect..) can range from .011 up to .013. Usually when you buy strings you tell the guy the smallest size string. That being the high E string. A good rule of thumb when gauging string size is this way. Look at the G string (No pun intended), is it a wound string like the E A & D? If so the size could be .011 or higher. If not it’s .010 and lower. I highly doubt it’s lower than a .010 on a Acoustic, but I have seen some acoustics (like Fender acoustics) with .090’s on them. I wouldn’t recommend putting .080 on either acoustic or electric unless you just have feather light hands with no strength. Sorry @YoBob but I have to disagree with you there. I would not recommend a string winder and I’ll tell you why. See the strings are constantly under tension and they fluctuate during play. If the string is not neatly tightly coiled around the tuner keys, during play it could (and will if you do quite a bit of bends) slip. This causes the string to go out of tune. Yes, it might wrench on your wrist when restringing a guitar, but it’s less head ache in the end. I recommend 2–3 wraps on an electric, 3–4 on an acoustic- and as little as 1 for locking tuners. These of course being the wound strings. The string that aren’t wound are going to slip for a good while before properly stretched to seat well enough to hold the current tuning. So if you try to only get like 2 wraps on the unwound string you’ll probably still end up getting around like 4 due to them having no grip with the smooth surface. She has bronze strings and the G string is bronze as well (wrapped like the E, A and D). I have an unopened Custom Light Phosphor Bronze 1st – .011. I guess I could open that package and see if the G string is the same diameter. Agree with @YoBob Just replace the whole set. This is how I wind mine.. I wouldn’t recommend doing it this way if you don’t change your strings as often as I do. Someone who’s not familiar with the experience of string slip might want a couple more winds, but this way will stay in tune better each time played as opposed to having a bunched up mess of potential slippage. @Rarebear agreed. I wouldn’t recommend 1 string replacement unless you’re in the middle of a set are able to quickly get one back on, as per se, an emergency situation. Always change every string when replacing strings. Less head ache and better sounding. But the question is actually a good one, as light strings feel very different than medium strings. I used to use light strings on my banjo because it was easier to play. But I started getting buzzing so I switched to mediums, which sound better and last longer, but took some time getting used to. So if you don’t know anything about strings and want to replace them with the same kind, really the only way to tell is to take it to someone who is used to playing guitars and ask them to play a little. Otherwise, you’re probably OK with medium-light or medium strings. @Axemusica – actually, this is exactly why I recommend a string winder. Personally I find it easier to get nice smooth symmetrical winds with a winder than by hand. As for acoustic strings, I prefer Martin Marquee Phosphor Bronze Lights. Different strokes I guess @YoBob. Ever since I started using locking tuners I’ve long since lost the the urge to wind up on the keys. 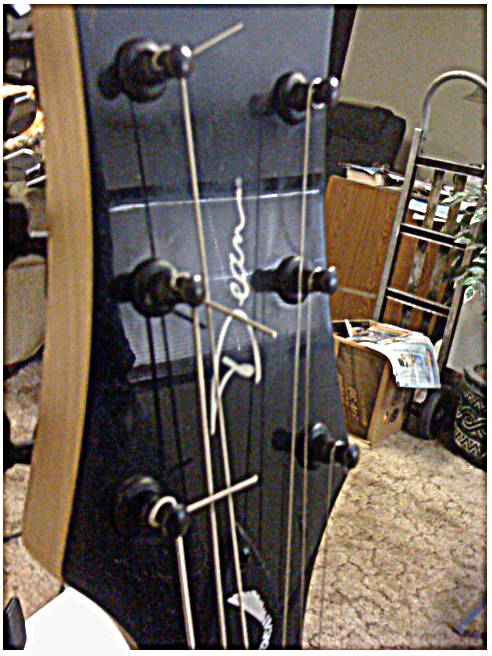 I also play very much, so my strings get mileage quickly & are dead with a few weeks. Although I do know what it’s like to get finished and be missing a few strings and I did not have the feeling of joy when it was over. It was more like raging fury that I had to bottle up before I smashed that guitar. This is probably why I play Hex Core .010 – .046’s now, so bright and very dependable. I don’t own that guitar anymore, lol. & good riddance. I need helping finding difference between the Ric O Sound and the standard input of a Rickenbacker? How do I tune a Spanish (classical) guitar? How similar is playing the ukulele to playing the mandolin? Can you learn to sing? Any other musicians in here?